Fresh spring leaves of American hornbeam (Carpinus caroliniana). The temporal pattern of tissue allocation can have important links to overall fitness. This is especially important as climates are changing: potentially threatening species with very constrained seasonality in allocation. 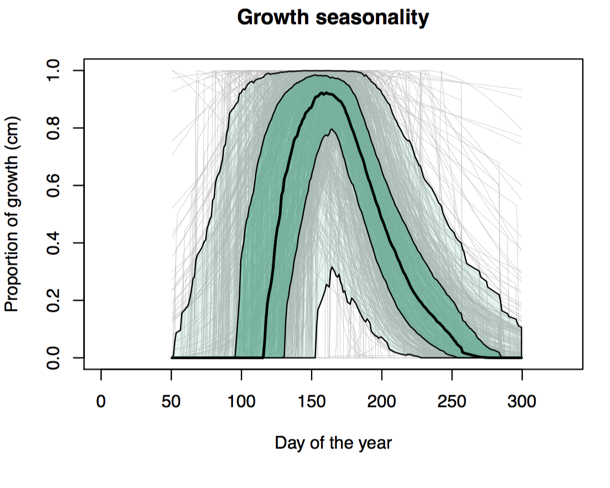 We have found that bole growth in temperate forests is highly constrained across species, and that the timing of summer droughts in a window of several months has a huge influence on the impact on forest carbon allocation to stems.